Pre-entries are in, and we have a pretty good idea of what the field will look like for the Breeders' Cup Classic on Halloween day at Keeneland in Lexington, Kentucky. We now know that 10 horses have been entered in the Classic and that there is a good chance that all 10 will enter the gate and try to win this thing. But, of course, only one can emerge victorious. American Pharoah: He's a great horse. No questioning that - you don't win the Triple Crown by accident. No horse has won the Triple Crown and the Classic, though - or even tried - so we don't know how it will go. He also is coming off a very rough race last time out in the Travers, and he has never faced older horses before. He is training brilliantly, though, and since this is his last race it would be fitting for him to go out on top. He has a lot to overcome, but he's just so freaking good, and he isn't going to have to deal with a lot of early speed. The price will be terrible, but he is absolutely the horse to beat here. Beholder: On Aug. 22 Beholder was just off the pace in the final corner at Del Mar during the Pacific Classic. Then, right before our eyes, she exploded to the front and won by eight lengths. I watch a lot of racing, and I don't remember a move that was any more impressive than that one - and it came when this mare was running against the boys for the first time. Now, this is a much better field. She is a big-day runner, though - she already has wins in two different Breeders' Cup races to her credit. She also has Gary Stevens on her back - as smart of a rider as we have ever seen. She is the biggest threat to the Triple Crown hero. Gleneagles: This is just so odd. This horse had won eight in a row (though was disqualified after one win) in Europe before his last outing - the last five in major grade 1 stakes races. On Oct. 18, though, he ran an absolute dud of a race at Ascot, finishing sixth. He didn't like the ground at all, and concerns about running surfaces had kept him out of action since June before that race. Now, less than two weeks and a continent later he's coming to the Classic. He is a truly elite horse. He has never run further than a mile, though, and this race is a mile and a quarter - a huge difference. He has also never run on dirt and will have very little time to train on it. And he's on very short rest. His breeding is good, and his trainer is among the best in the world, but this seems like a lot to ask. Frosted: Since winning the Wood Memorial, Frosted has made a habit of coming up just short - second in the Belmont and second in the Jim Dandy. He won the Pennsylvania Derby last time out, but that doesn't count for much. There is no shortage of talent, but he is facing top horses for the first time and needs to have the race of his life. Keen Ice: He has this going for him - he is the only horse since last August to beat American Pharoah. 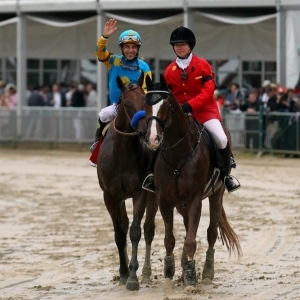 That had as much to do with what Pharoah didn't do on that day as anything, but this horse deserves some credit. Unfortunately, it was his first win since his first time out last September, and he is facing older horses for the first time. He's obviously talented, but he would have to have a great, great day. Honor Code: He was a top two year old two years back, then he sat out much of his three year old season with various issues. He has been a beast in his return this year - three wins in five outings, including two grade one stakes. I have concerns - most notably that he was run at a mile last time out and looked lousy. His breeding is fantastic, though, and he is a strong contender who could come in at a nice value price. Smooth Roller: This is another odd story - this is a four year old that only debuted in June of this year, and he has only run four times. His fourth race, though, was a grade one win at Santa Anita. It's a lightning-fast ascent to the top of the game, and he is probably in over his head, but the potential is clearly there, and he's obviously improving each time out. Effinex: Three races back he beat Tonalist - at Belmont, no less. Since then he has looked pretty ordinary in two outings. Was that race a fluke? Or is he ready for another breakthrough? It's not like that win was his only nice win, but he would have to be much improved to win here. Want free Breeders' Cup picks? Doc's Sports has you covered - get $60 worth of picks free from any of Doc's Sports expert handicappers. Click here for free picks (new clients only).